The anklet is an ankle string, ankle bracelet, or ankle chain that women, as well as girls, wrap around their ankle. Anklets are made of various kinds of materials such as shells, beads, nylon, plastic, leather, silver and gold and can of different designs. Formal anklets (gold anklet and silver anklets) are highly preferable as among married girls and women. Basically, anklets belong to the fashionable piece of jewellery and an integral part of the accessories that women wear. 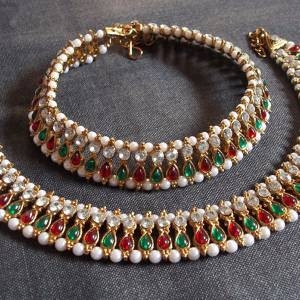 Especially Indian women use to wear such jewellery pieces because India is the only country that highly emphasized on them from time immemorial. The anklet is the ornament that holds top-rated social and spiritual significance in Indian culture. Also, anklets are known as Payal that women wear on their daily basis after marriage. 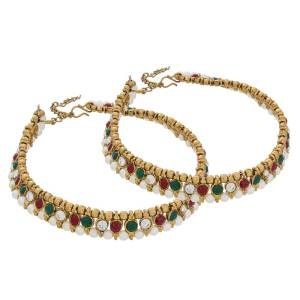 Anklets with toe rings have been worn in India from the ancient times. The trend of wearing anklets design is quite bit pre-historical as it was noticed first in the Mesopotamia civilization. Anklets mainly originated in Arab, Egyptian, and Indian cultures for centuries. In those cultures, girls and women from the just dominant class of society used to wear silver anklets and gold anklets design in order to flaunt their status as well as wealth. During those days, women wore a variety of anklets designs to let people know about their presence around them when there was the purdah system, especially in Arab countries. Later, women belonging to the American culture started to wear this ornament just as a fashion statement. Anklets were known as the simples, lighter as well as smaller anklet piece that was not enough to show off about wealth. However, it was used to express lots of things in the ancient times. Anklet underwent several changes in its appearance such as look, form, styles, designs, etc. Anklets designs evolved in fashion and look as it traveled across several civilizations over countries. In the past years, it expressed the marital status of a woman and was mandatory to wear it at any cost just because of its regional and cultural influences. But, such tradition has dried out according to the tremendous modesty changes. During this time, it is a favourite ornament as countries like Europe, U.K, the U.S contributed to making it much modern and slicker. Today, in this modern time, girls and women prefer wearing silver anklets design as well as gold anklets design to a great extent to signify their outfit, especially in Western and Indian cultures. Now, women wear anklets designs not only on special occasions but also complete their ethnic wear such as Kurti, Saree, etc. The silver anklets designs, as well as gold anklets, grab the attention of a woman to be a point of attraction for the upcoming special event. Thus, anklets make itself one of the most wearable accessories. Women wear gold anklets that enhance their beauty. Anklets also provide a melodious sound that makes girls do love to wear various anklets designs. Furthermore, people from several cultures live together in such traditional country, India. Women make men to welcome her with more respect and do not allow for any kind of misbehave as they are indicated before reaching there just because of anklets sound. Also, the sound that anklets produce removes all the negative energy from surroundings, mind, and soul as well. Women also experience benefits of wearing gold and silver anklets because metallic anklets keep rubbing against your bone that makes them much stronger. There is a lot of variety of anklets designs that you often find in the market. You should have to buy that only anklet design that suits your attire perfectly. When you buy a metallic anklet such as gold or silver anklet, you have to keep the standard of event that you are attending soon. You should wear the tight anklet designs that stays above your ankle bone while wearing western clothes. If you cover with traditional attire, you should go for the latest anklets design that is above your ankle bone. You should be careful with the anklets design according to the footwear. 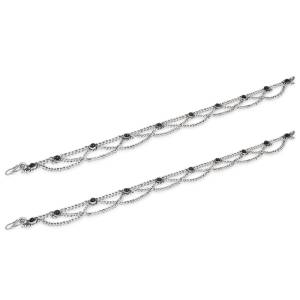 Moreover, silver anklets design for bride is highly recommended on the day of her marriage. Women those prefer wearing anklets can find beautiful gold and silver anklets online at Craftsvilla. We provide you trendy anklets designs that are up to its peak point in fascinating women and girls as well. Craftsvilla belongs to one of the primary fashion jewellery wholesalers station in India that attract the majority of customers from all over the world and provide high-quality, bridal anklets, anklets for girls, silver anklets designs for bride, gold anklets, or whatever you wish. 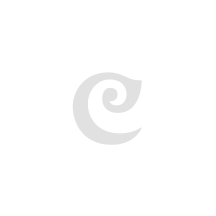 Craftsvilla believes in ensuring its superlative quality that is directly proportional to its identity. It proffers latest anklet designs and styles at wholesale or affordable cost. One of the fantastic things you can find that its price is lower mainly for golden plated and silver anklets shopping online. It avails a wide range of anklets designs when you think to buy anklets online. It delivers imitation anklets and quality fashions that contribute it to grow in all over the world. It has the ability for worldwide shipping to delivers products at competitive prices. If you ever think about to buy anklets online, it services efficiently that you can pay using your PayPal account (for international customers), paytm and bank deposit, debit card, credit card, net banking. If you are not satisfied with the delivered golden plated or silver anklets online or products have any manufacturing defect, you can return it and ask for another perfect one for you. 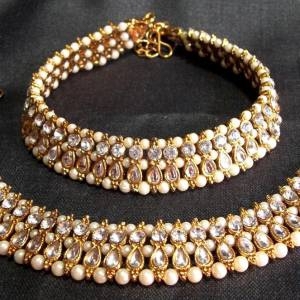 Here, you are not bearing any extra charges when you do gold anklets or silver anklets shopping online. Alternatively, we offer you to buy anklets design online during our peak seasons (festivals like Holi or Diwali, sale or discount session, etc.). What you only have to do is just to go to our website and read our articles, reviews that people give us after experiencing the excellent quality, pocket-friendly prices and lots of other positives. We never disappoint our customers, and our quality and latest fashion make them go for gold and silver anklets online shopping with us again and again. We greet our customers every single time with new anklet designs, latest style form and unusual anklets designs.